You’re Invited Boulder and Front Range Friends! Take advantage of a unique opportunity to see and shop in a Global Textile Marketplace when ClothRoads brings a range of beautiful items from around the world to Shuttles, Spindles, Skeins Yarn Shop. A ClothRoads Pop Up Marketplace is your gateway to a world of authentic textile culture. From the rivers of India to the mountaintops of Peru, we go directly to the source to find textiles made by artisans using ancient natural dyeing methods, subtle and beautiful weaving techniques, spinning, printing, and much more. Products featured support artisan-made women cooperatives dedicated to creating a sustainable environment for the artists and their families. For ClothRoads it all started at Shuttles, Spindles and Skeins — our first trunk show in 2010 before there was a website, a blog, or retail studio. Please join us as we celebrate this great friendship at one of America’s Most Loved Yarn Shops. Special SALE items only at this Pop-Up Marketplace! It’s a textile palooza coming to Shuttles, Spindles and Skeins. We’re cleaning house at ClothRoads so that we can get back on the cloth road this spring, buying new artisan-made textiles. There are DEALS coming your way. $10.00, $20.00, $30.00 baskets of textiles to sort through looking for the perfect bargain. Be first! Don’t wait. 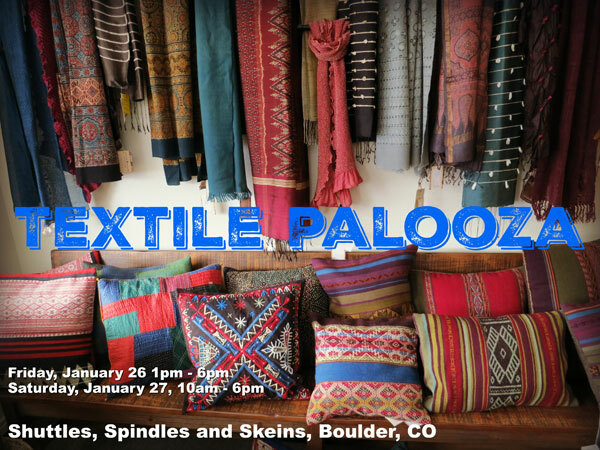 We open at 1pm on Friday, January 26th at Shuttles, Spindles, and Skeins, Boulder, CO.